The original Disneyland designers frequently populated their renderings with guests who appeared dressed for a day of sophisticated entertainment – because this was Disneyland after all! A new, highly developed, exhaustively detailed entertainment experience. No flip-flops or cargo shorts here! These were men in sharp suits, toddlers working two-pieces, and ladies looking like pages from Dior’s sketchbook – all as if a visit to Disneyland were on par with a night at the opera. And why shouldn’t it be? 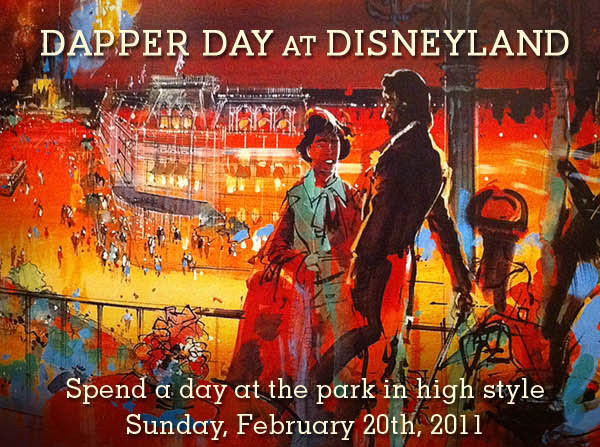 That’s what this day is about, realizing those designer’s dreams that Disneyland be seen as the upscale escape that it is, filled with guests dressed appropriately for it. So, I found out about this the morning before, as part of my Saturday morning ritual consists of checking out the Mice Age website. I mentioned the event to my wife later that morning, not in a “we should go” tone, but just an fyi. 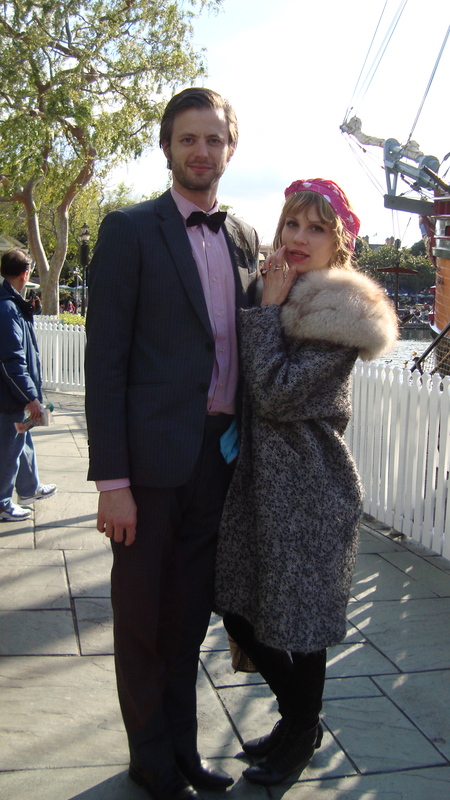 Well, her love for vintage and themed events overruled the fact that she isn’t as in to Disneyland as I am. She said let’s go, she’ll call her sister’s in-laws who both work at the park and see if they could get us in. They could, so we sprung the news on our 8-year-old son, who took it rather well I would say. So a lot of strategy was required balancing dressing up with the fact that we’re going to be walking a hell of a lot and it was only going to be in the mid-50s, dropping into the 40s at night. So I ruled out a suit, as suit pants are rather light weight and offer little warmth. I settled on a gingham shirt and Classic chinos from J. Crew, a mid-90s vintage (is it considered vintage if you’re the original purchaser or just old?) 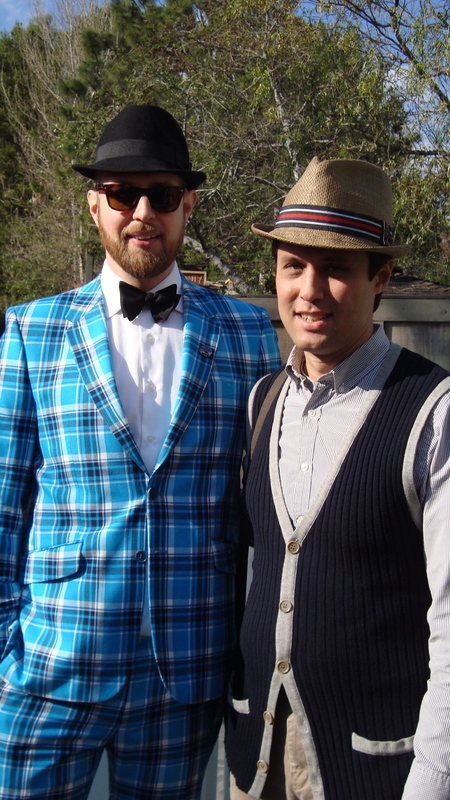 Emporio Armani sweater vest, and a stingy brim straw fedora that my wife picked up new at a thrift store for $1.50. 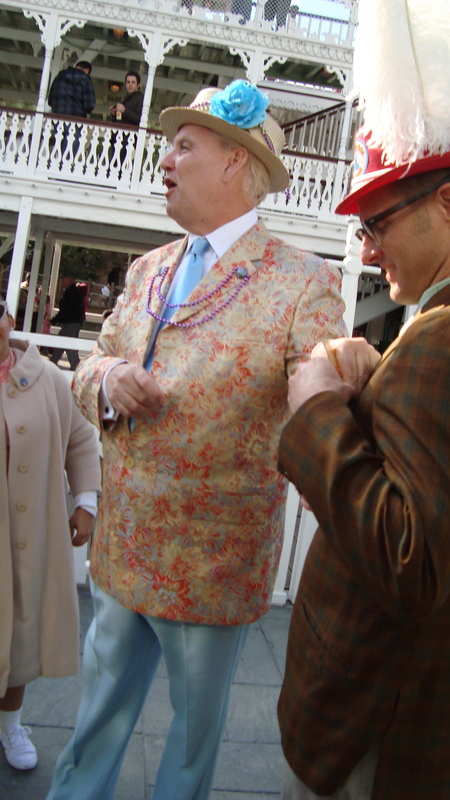 We all met at the Mark Twain Riverboat at 3pm. First it was just us and 2 other couples, then a bunch of other people showed up. There were probably 30 of us, most in fashions from the mid-20th century. A fair number of participants were ex-Disney employees or worked with Disney in some respect. Pictures were being snapped by us and by other guests who were wondering what the hell was going on. 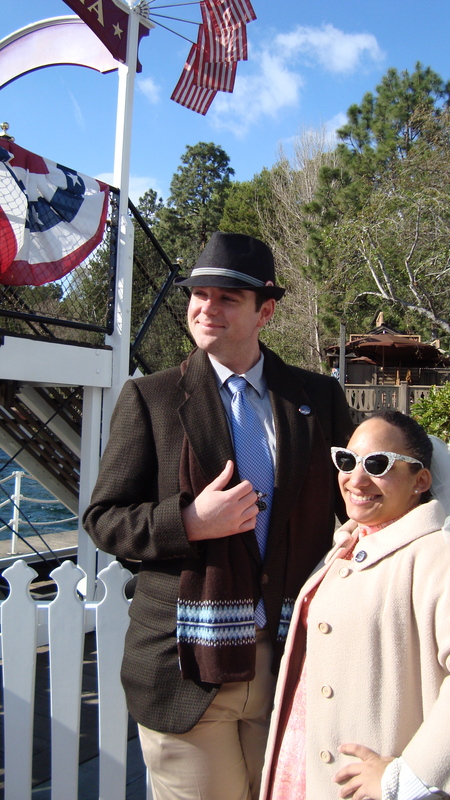 We had to wait for the Mark Twain to return, so we didn’t actually ride the boat until around 3:30. Still, we found out others missed the boat as we ran into them later. You can’t be fashionable without being fashionably late, I guess. 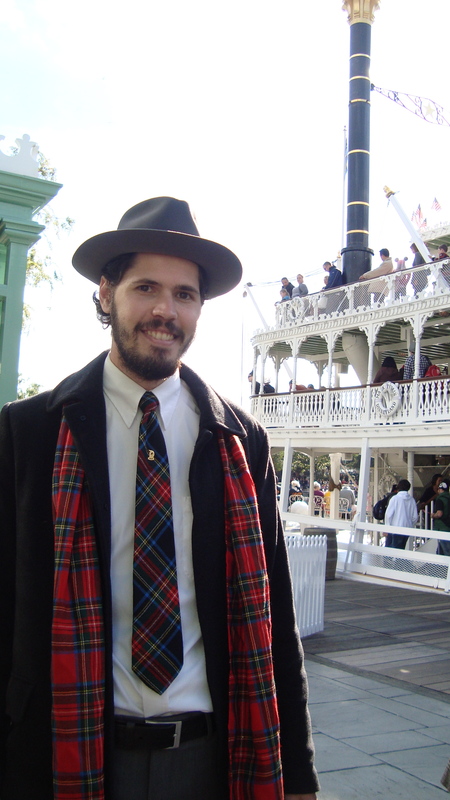 It was a fun ride talking to the other participants, and also for my son who had never been on the Mark Twain. He loves boats, engines, steam, etc. After the ride, we had to split as we were the only ones with a kid. The adults later moved on to the winery at California Adventure. 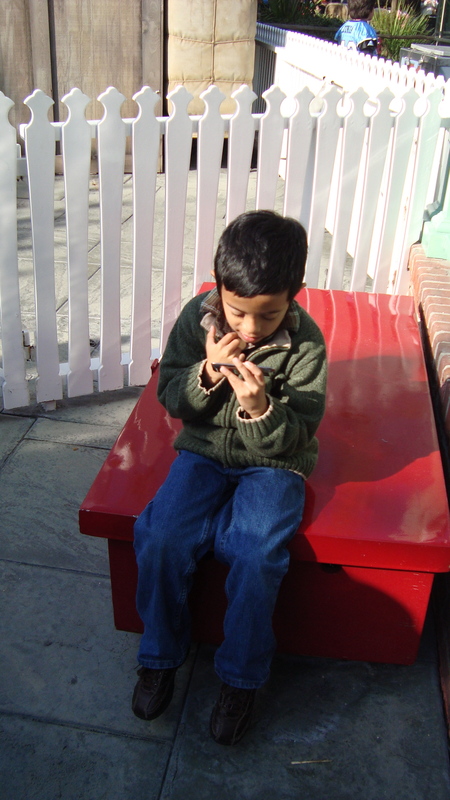 Angry Birds kept my son occupied while we waited for the Mark Twain. So glad you joined us. 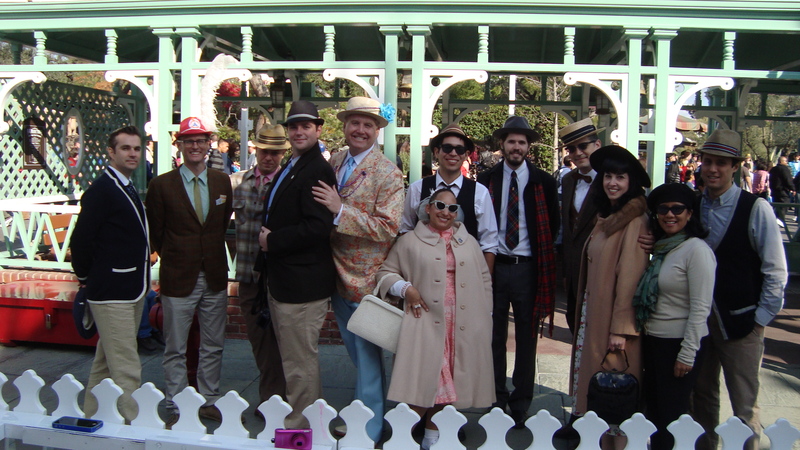 Watch http://www.DapperDay.com for more pics and future events.